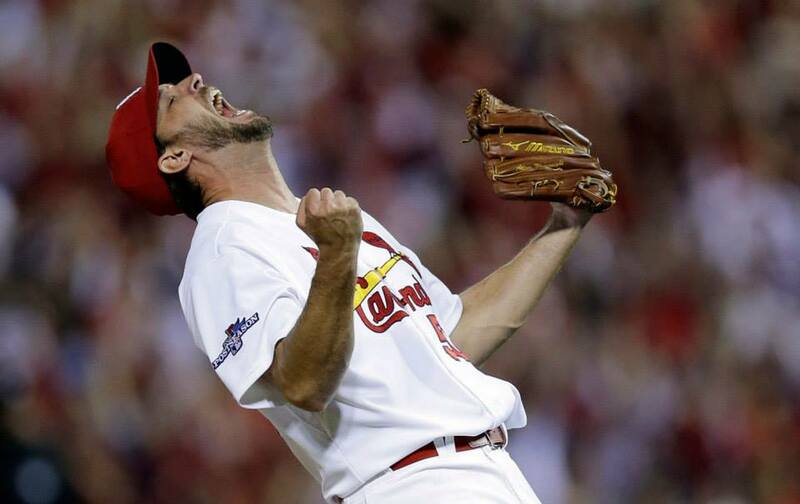 Wainwright Leaves No Doubt – Cardinals Are NLCS Bound! Before Adam Wainwright took the mound to try to carry the Cardinals into their third-straight NLCS, before newbie Matt Adams and Mr. October David Freese blasted their way past those pesky Pirates, before 47,000+ fans made their way through the gates at Busch III to see which team had more magic left, Adam Wainwright thought about his last NLDS Game 5 start. That game didn’t quite go according to plan. Six runs in 2 1/3 innings? Not exactly vintage Waino. But, the Ace said, that may have been the problem. That night against the Nationals, Wainwright — who has always deeply admired Chris Carpenter — wanted to recreate a magical night from one year earlier: Carpenter’s shutout in Game 5 against the Phillies. Wainwright also, somehow, seemed to believe that his career thus far was at least partially defined by that game. He repeatedly said that he wanted to prove himself a capable playoff pitcher. He didn’t want to let that game upstage his successes. He wanted to prove he was better than that. This is the same guy who closed out the 2006 postseason with a World Series win. He’s been in multiple Cy Young Award conversations. He battled back from Tommy John’s surgery to help his team to within one game of the World Series last year. This year, all he’s done is lead all of baseball in innings pitched and complete games. He’s walked just 36 batters in 36 total starts (including this postseason thus far). What did he have left to prove? Whatever it was, he did it Wednesday night. The Pirates lineup that had dissected Cardinals pitching in the regular season was rendered useless. Even an inning of sloppy — and potentially costly — defensive miscues couldn’t knock Waino off his game. He showed the ferocious competitiveness of his predecessor, Chris Carpenter, and the unflappable resolve of his second-year manager, Mike Matheny. He was locked into Yadier Molina all night. After throwing 96 pitches through eight innings, there was no doubt the ninth was his to finish. Even with two runners on and two out, Wainwright stayed in control. This type of game has a way of producing images that are seared into the minds of those lucky enough to witness them. This game had many such moments. David Freese’s two-run blast that allowed Cardinal Nation to breathe (if only for a moment) early in the game, Pete Kozma’s diving snag to keep the Pirates at bay, and Matt Adams’s sky-high homer that sapped the last bit of energy from the Pirates dugout, to name a few. But the moment that will last the longest is the embrace as Ace met MVP between the mound and the plate, Wainwright realizing what Molina likely knew all along — Adam doesn’t have to be Chris Carpenter. It’s more than enough to just be Waino. Happy celebrating, Cards. You earned it. This entry was posted in 2013 Season, MLB and tagged Adam Wainwright, Busch III, Busch Stadium, Cardinals, Chris Carpenter, David Freese, Game 5, Matt Adams, Mike Matheny, NLCS, NLDS, Pete Kozma, Pittsburgh Pirates, St. Louis, Yadier Molina by Tara Wellman. Bookmark the permalink.